Desalination is the process that converts saltwater into water that can used for drinking, agriculture, or industrial uses. In the United States, desalination is used as a supplementary source. For example, 10 percent of the water supply in San Diego county in California comes from desalination. But in the Middle East, the number is much higher—48 percent of the world’s desalinated water is created in the region. But desalination produces brine, a salty byproduct that can contain other chemicals. Journalist Tik Root talks about the trade-offs when it comes to desalination. 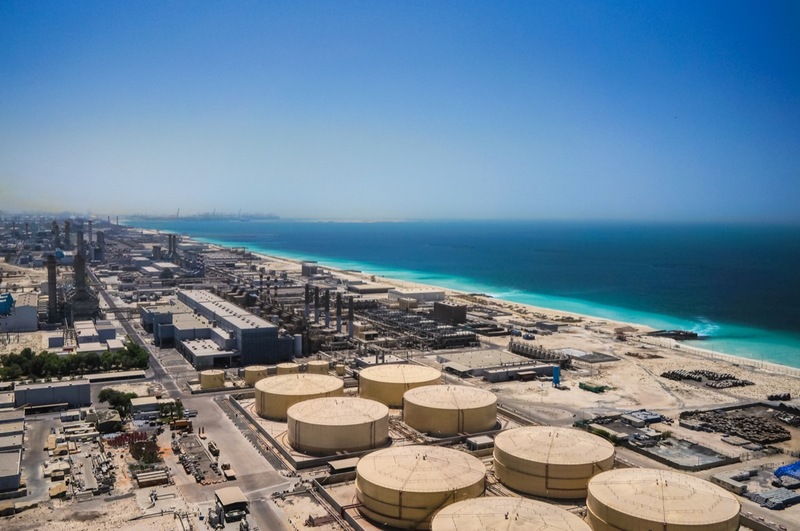 Read Tik Root’s article on how desalination plants may produce more brine than previously thought. Learn more about desalination and toxic waste. Tik Root is a freelance journalist based in Washington, D.C.
JOHN DANKOSKY: And now it’s time to play Good Thing, Bad Thing! Because every story has a flip side. Water, of course, is a big battle. Cities are trying to figure out how to get clean water for growing populations. One solution is desalination– the process of turning ocean water into salt-free drinking water. Plants are popping up in California, but the technology has really taken off in the Middle East. The process also produces a briny byproduct that could be toxic. Here to fill us in on the good and bad is Tik Root who wrote about this for National Geographic. He’s a freelance journalist based in Washington. Welcome, Tik. TIK ROOT: Hi. Thanks for having me. JOHN DANKOSKY: So there are desalination plants in California, a lot popping up in other places of the world. First of all, tell us how widespread is this technique. How many places are using it? TIK ROOT: So I think there’s about 177 countries using it, but it’s mostly in the Middle East. About half of the desalination in the world happens there. It’s happening in the US. There’s some big plants in California and in Florida, in Tampa Bay, actually. But they aren’t the major players. It’s mostly in the Middle East. JOHN DANKOSKY: What are the techniques that are used to desalinate water on such a large scale? TIK ROOT: So I think historically there’s been thermal desalination, which is basically heating up the water to evaporate the fresh water out of the salt water. And then a newer one is reverse osmosis, which pushes salt water through a membrane, separating the fresh water from the salt water so that they can use it for drinking water. JOHN DANKOSKY: And it’s seemingly being used for drinking water for a whole lot of people, not just in California– as you say, in the Middle East. This is providing a clean source of drinking water for lots and lots of people. TIK ROOT: Yeah, there’s almost 16,000 desalination plants. And the International Desalination Association claims there’s about 300 million people who get some portion of their water from desalination. So it’s definitely out there. And I think as water scarcity increases, it’s definitely something that especially richer countries are going to look to as a solution. JOHN DANKOSKY: OK, so it seems like a good solution. It’s going to get water to people who don’t have it. But there’s a byproduct of this technique, and it’s brine. And maybe you can tell us about brine and what the impacts are as this byproduct is created. TIK ROOT: So brine is what’s left over when you either evaporate or membrane out the fresh water. There’s this concentrated salt water that’s a little bit warmer. And if you’re on the ocean, which about 80% of desalination plants are within 10 kilometers of the ocean, then that usually gets dumped back into the ocean. And proponents of desalination will argue that you’re just dumping salt water back in the salt water. And it’s not a big deal. But some biologists look at it and say that this is very concentrated salt water. And when it goes back in, it raises not only the temperature of the water in the nearby area, but also the salinity, which will reduce dissolved oxygen levels and can be really harmful for organisms that live near plants. JOHN DANKOSKY: And it’s not just brine that’s in the substance. There’s other chemicals in there too. What do we know about that? TIK ROOT: Right. So when they push the normal seawater into a plant, they usually add chlorine or copper to help it keeping from corroding the pipes inside the plant. But that substance also gets pushed back out with the brine and is potentially toxic. We don’t honestly know a whole lot about it. There’s not a whole lot of reporting on brine. And so there’s just not much we know about what kinds of substances are going back in with it. JOHN DANKOSKY: Last thing for you. Desalination can also be pretty energy-intensive too. What can you tell us about that? TIK ROOT: Yeah, so I think that’s arguably the biggest environmental effect of desalination, is that you have to use fossil fuels or electricity driven by fossil fuels, largely, to power these plants, which is one reason you’re seeing it in the Middle East, where there’s cheaper or more abundant oil. Those countries can afford to pump out desalinated water, which uses a ton of electricity and costs about twice as much to produce as, say, a reservoir or something like that. JOHN DANKOSKY: Tik Root is a freelance journalist based out of Washington DC. Thanks so much for bringing us this story. I appreciate it. TIK ROOT: Thanks for having me. Desalination is growing in popularity, but is it sustainable enough to solve our water problems?